Location: Saignes, in the Meurthe-et-Moselle departement of France (Lorraine Region). Ownership / Access: Pierre de Lagarde de Saignes. 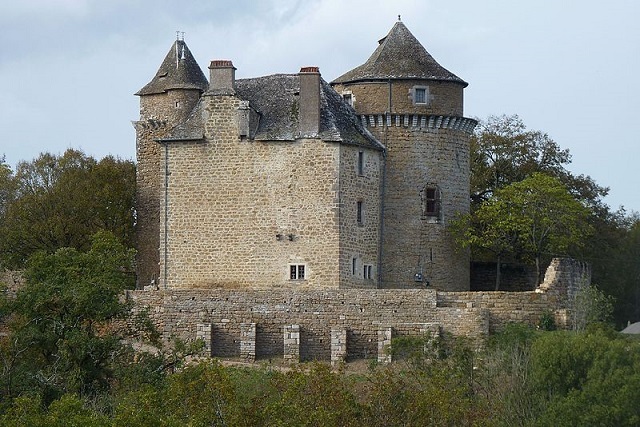 Notes: The castle of Saignes is a castle located in Saignes, France.The family of Lagarde is native of the seigneurial land of La Garde, located in the viscount of Turenne, in the Limousin, two places of Tulle. The oldest known member is Géraud de La Garde, lord of La Garde, who lived in 1240. From this family came Cardinal Geraud de la Garde de Daumar (died in Avignon, September 27, 1343), Master General of the Order of Preachers in 1342, son of Bernard I of La Garde (died in 1327) lord of La Garde and Daumar near Tulle. Pope Clement VI said he was of his blood, therefore a close relative. His brother, Étienne de La Garde, was appointed Archbishop of Arles in December 1350. Another brother, Guillaume de La Garde, was Archbishop of Braga. Bernard II of La Garde, Lord of the Garde and of Daumar, is their elder brother. Geraud II of La Garde who founded the branch of Saignes and Parlan is their cousin. According to Father Maria, the family of La Garde would have settled in Saignes around 1379, afterwards taking the name of La Garde de Saignes. The "castrum de Siognâ" was acquired in 1379 by Bertrand de Lagarde from Argentat. The origin of the branch of the Gardens of Saignes and Parlan is Géraud II, fixed at Argentat in 1364. In the enumeration of 1504, Barthelemy de Lagarde is lord of Saignes and Lunegarde. He declares that he possesses at Saignes "a house and an old tower, and its dependencies." The present castle was built by Pierre IV de Lagarde, born at the end of the fifteenth century, died in 1566. It was covered with honors by Francis I. In 1518, he was appointed adviser to the parliament of Toulouse. In 1519 he was his extraordinary ambassador to the kings of Poland, Bohemia, and Hungary to ask them not to oppose his pretensions to the empire. After the battle of Pavia and the imprisonment of the king, the regent of France sent him to Edinburgh, where he stayed between June and November, to oppose the project of the King of England Henry VIII to strengthen the bonds between the king, England and Scotland by a marriage of Jacques V with the only daughter he had then and loosening the secular ties between Scotland and France. After the Treaty of Cambrai he was sent by Francis I to Portugal to King John III in October 1529. The object of this mission was to obtain aid from the King of Portugal for a loan of 400,000 ecus for the payment of the Ransom of the king and to allow the liberation of his sons, the Dauphin and the Duke of Orleans, held hostage in Madrid. During the troubles of Guyenne which led to the banning of the parliament of Bordeaux, he was sent with the office of first president of the Tournelle between 1 January 1549 and 10 August 1550.